William Powhida What Is Art? A portfolio of twelve archival digital prints measuring 11 x 14 inches in an edition of 20. “Last fall I was asked by artist duo Ghost of a Dream to participate in an artist trade project, Art for Artists. The trade involved making a unique multiple, or a drawing that could incorporate some forms of reproduction. I used a stencil and airbrush to create a notebook paper ground, where the shadow and edge of the paper varied with the application of the airbrush to the stencil, creating some variation within the single outline of the sheet. 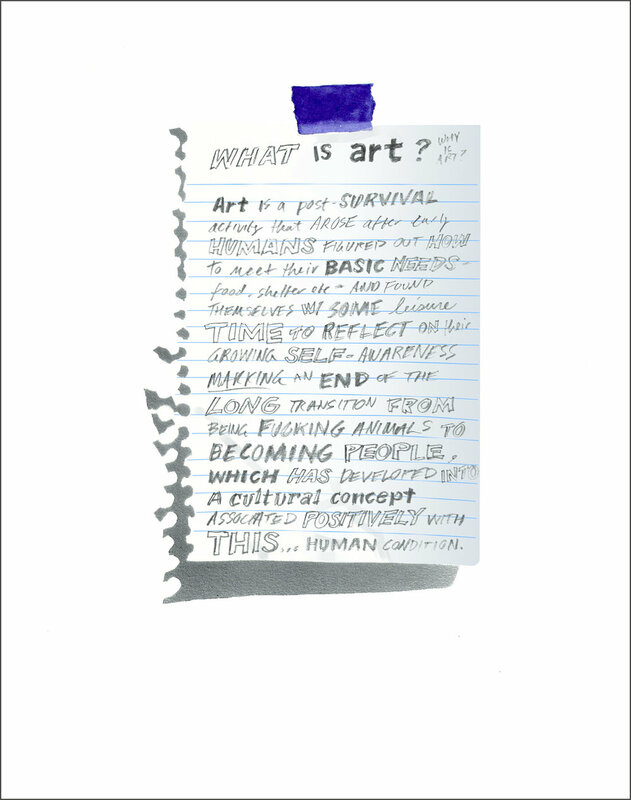 On each of the grounds, I responded to a question I have been asking myself for years now, ‘What is Art?’ Each response was drawn in graphite on the stenciled pages after I added the blue lines in colored pencil. The responses reflect a growing suspicion that art may not be the social or cultural ‘good’ we'd like it to be, but perhaps the by-product of social and economic forces opposed to art. Making the drawings within a solidarity economy, trading not selling, opened up a less contradictory space to make the statements, but they were made for an audience of other artists." Melissa Pokorny is a sculptor based in Urbana, Illinois. She has shown her work in venues across the US, in Chicago, New York City, Seattle, San Francisco, and Los Angeles. She is an Associate Professor at the University of Illinois, in Urbana Champaign. Platform was pleased to present the trailer for Stephen Hilyard's Катюша (Katyusha), a three channel, 28 minute video piece based on material collected at Pyramida, a showcase community established by the Soviet Union in the Svalbard territory in the high Arctic. At its peak Pyramida was home to more than 1000 coal miners and their families. It was evacuated in two days in 1998 leaving a ghost town. Катюша (Katyusha) presents three fictional characters who personify different aspects of Pyramida. The Guide takes the form of a gray sea bird, the Northern Fulmar. As the piece progresses we discover clues to the identity of two Lovers, a ballet dancer and a basketball player. The elaborately painted floor of the basketball court in Pyramida is a central motif, as is the abandoned ballet studio in the northern most corner of the town—once the most northerly ballet studio on earth. Time becomes unreliable as the viewer jumps back and forth uncontrollably between two time periods. In Andrew Rubinstein’s new body of work, stripes become stand-ins for filaments as well as for subatomic and cosmic building blocks. In many cases these marks appear to form a pattern and appear to touch, but they ultimately do not. It is with this vocabulary the artist attempts to represent how he marvels that society, and reality as we know it, appear to hold together. In the current political climate the tension between the appearance of order and its potential breakdown is especially poignant. In these paintings, compositions subtly shift between architectural structures, portraits, astronomical imagery, even textiles. The work approaches the heavy issues of the day but in a playful way.